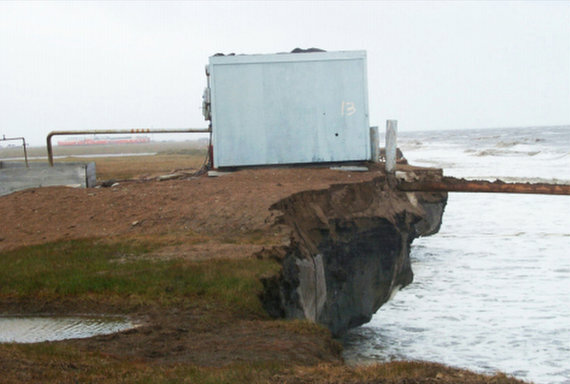 Climate change stands to trigger a regime change in Alaska, with far-reaching consequences as frozen ground thaws beneath us, a prominent University of Alaska Fairbanks scientist told the Tanana Chiefs Conference on Tuesday. "Permafrost is the most important part of the ecosystem for engineering in Alaska," said hydrologist Larry Hinzman. "When you thaw the permafrost, everything falls apart." Hinzman, the director of the International Arctic Research Center, said Alaska is well on its way to switching from a frozen to a thawed state -- not a seasonal swing but something more permanent. The permafrost in much of Interior Alaska is already just a degree or two below the freezing point, he said, with warming expected to continue in the decades ahead. "A degree or two warming of climate makes a big difference in our world," he said, adding that computer modeling shows more warming in the future. "This amount of warming can take Alaska from being frozen to being thawed," he said, with glaciers turned into water, and permafrost into thawed ground.